Now in paperback, “Wunderkind is a gift for all the senses. 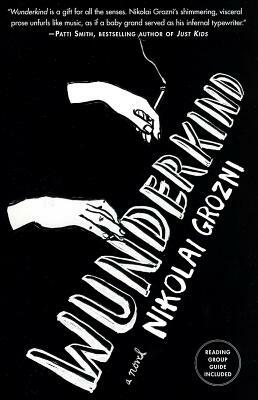 Nikolai Grozni’s shimmering, visual, and visceral prose unfurls like music, as if a baby grand served as his infernal typewriter” (Patti Smith). Fifteen-year-old Konstantin is a brash, brilliant pianist of exceptional sensitivity in the bleak and controlled environment of Sofia, Bulgaria, in the 1980s, struggling toward adulthood in a society where honest expression often comes at a terrible cost. Confined to the militaristic Music School for the Gifted for most of each day and a good part of the night, Konstantin exults in his small rebellions—smoking, drinking, and mocking Party pomp and cant at every opportunity. Through it all, Konstantin plays the piano with inflamed passion, transported by unparalleled explorations of Chopin, Debussy, and Bach, even as he is cursed by his teachers’ numbing efforts at mind control. Hypnotic and headlong, Wunderkind’s dazzling portrait of youthful turmoil gives us a stunningly urgent, exquisitely observed, and wonderfully tragicomic glimpse behind the Iron Curtain at the very end of the Cold War while reminding us of the sometimes life-saving grace of great music.